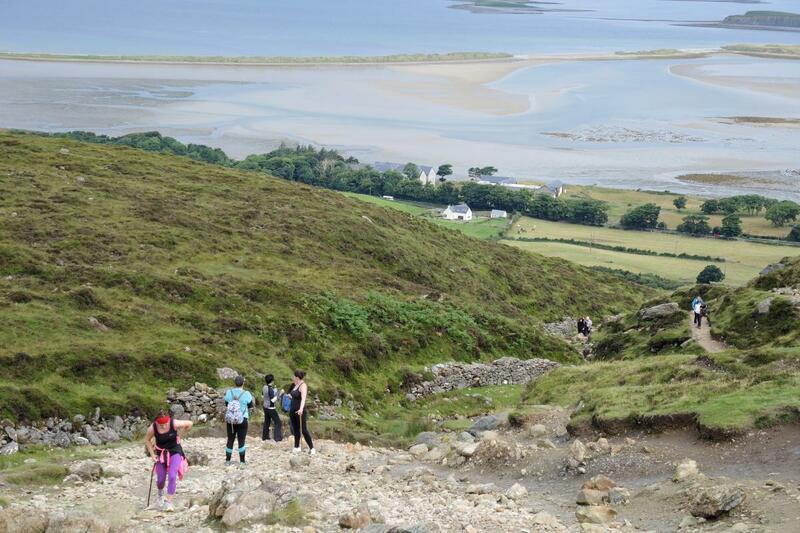 On the last Sunday of July, except when difficult weather makes it entirely unreasonable to do so, as many as 25,000 people converge near Clew Bay in County Mayo, on the west coast of Ireland, to hike the rocky slopes of Croagh Patrick, a mountain associated with St. Patrick. The hikers, ranging from kindergartners to octogenarians, participate in a tradition that for 1,500 years helped bind Catholic and Irish identities so tightly as to make them seem almost indistinguishable. Labeled “Ireland’s most dangerous climb,” Croagh Patrick rises 2,507 feet from the bay below to its summit through fields of loose rocks and often through dense fog and clouds which make the mountain seem impassable, and yet as a matter of a tradition that dates back at least to St. Patrick, pilgrims brave the well worn paths to reach a small chapel at the summit.1 The pilgrims’ motivations today are more varied, and the link between Catholic and Irish identities is more problematic, but the tradition of climbing this mountain on the day known as “Reek Sunday” remains a significant part of Irish culture. 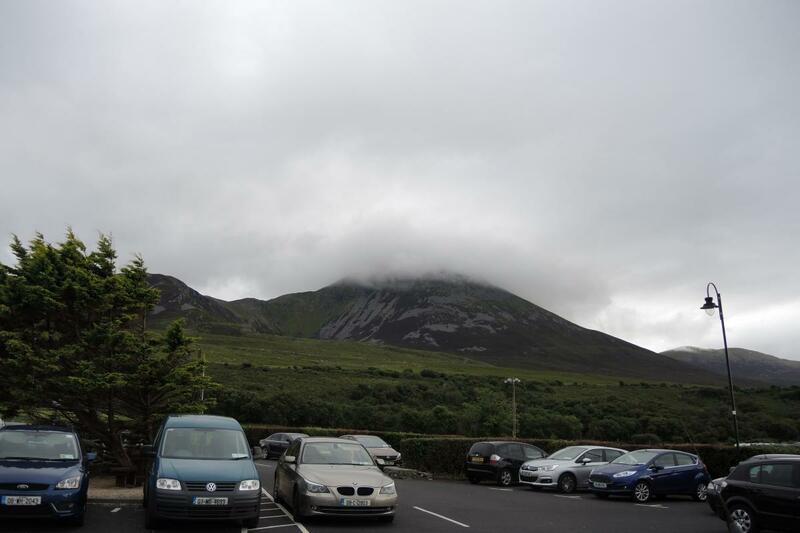 The legend of Patrick, recounted in the book of Armagh, lends credence to the idea that Croagh Patrick was a sacred site before the rise of Christianity. The legend claims that Patrick went to the mountain in the year 441 to convert either a king or a Celtic god who lived on the mountain. Besides converting the king, the legend goes, Patrick defeated the king’s mother in battle, who was herself a demon, and cast her into the lake below. The demon then fled then to Lough Derg, another site of Irish pilgrimage, where she was ultimately defeated by Patrick. Clearly Patrick, or at least his hagiographers, knew that the mountain was a site with such spiritual resonance that it needed to be an element of his story. Another important part of the story, more often quoted, is that Patrick and his small band of believers spent 40 days on the mountain in prayer and fasting. Atop the mountain today, near a small chapel dedicated to the saint, is a small area of stones marked off said to be where he slept for the duration of his fast. Tropes like this mirror the stories of the desert fathers, particularly Anthony of Egypt, casting him into the mold of those who have come before him. Whether he ever arrived at the mountain is uncertain. What is certain is that the mountain has been associated with Patrick since at least the 12th century, and that some form of Christian pilgrimage has existed at least since then. The climb is certainly an ancient and longstanding practice, but we also know that it was revived and greatly expanded in the early 20th century, as Catholicism and recovered Irish cultural traditions were brought to bear as the core foundations of the nationalism that enabled the founding of Irish state. 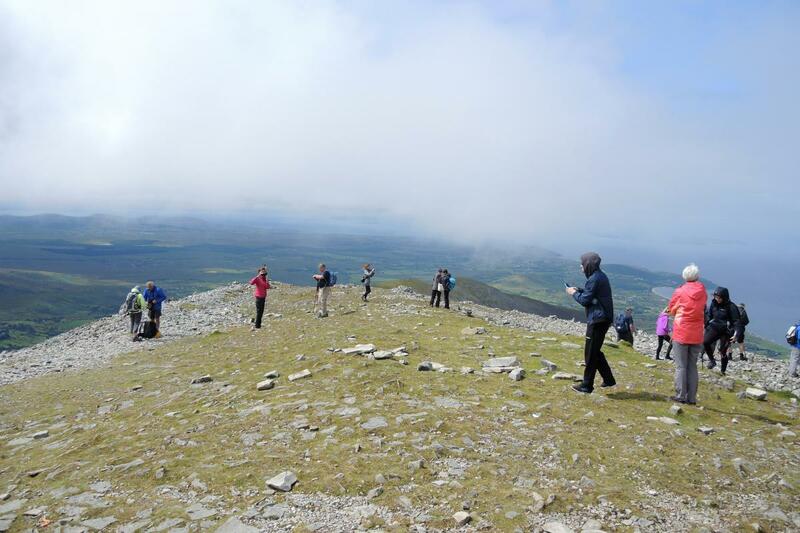 While people climb Croagh Patrick throughout the year for various reasons, the traditional time to ascend the Reek, as the mountain is often called, is on the last Sunday in July, which roughly corresponds to the Irish harvest festival of Lunasa. The weekend begins with Garland Friday, which is celebrated mostly by local people. 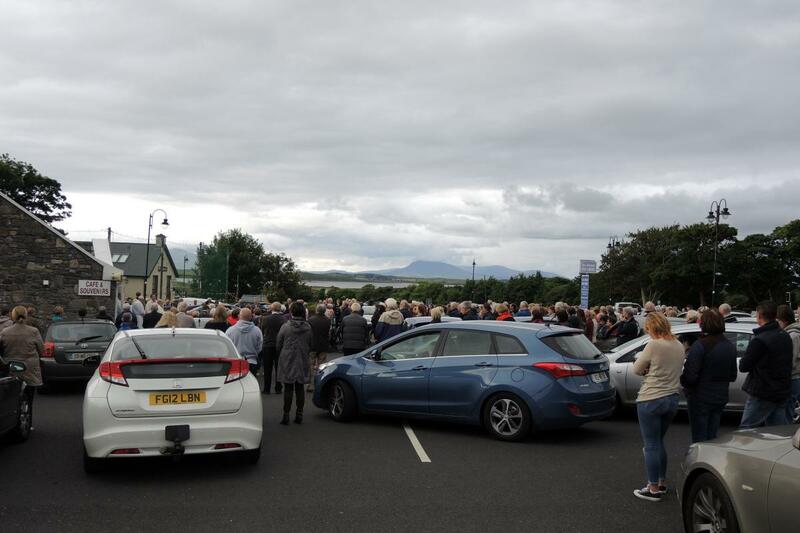 As a priest from the local parish in Murrisk who celebrated Mass at the base of the mountain on the weekend in 2016 noted, “This is our day at the Reek.” Parishioners gather for Friday Mass in the same parking lot that is soon to be overfull with pilgrims’ cars for the rest of the weekend. Many of the local people noted that they would be working in some capacity or another, either in hospitality or in crowd control, as the number of pilgrims climbing the mountain reached its peak on Sunday of that weekend. The ascent along the traditional pilgrim path begins from the north side of the mountain in the village of Murrisk. At the base of the mountain there is a small parking lot and a visitor center, as well as several stands selling religious items and that also rent walking sticks hewn from nearby trees. There is also a small pub near the base of the mountain, which is as full of locals as it is of pilgrims. 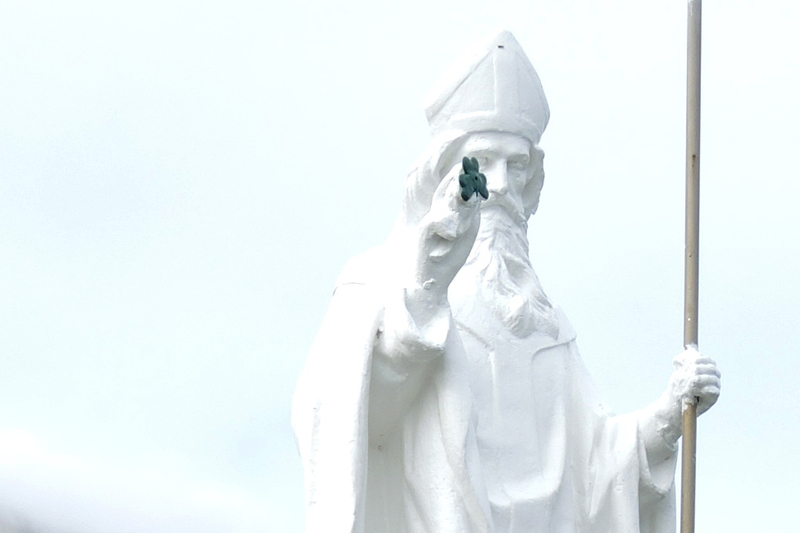 Beyond the stands and sellers lay a set of stairs up to a statue of St. Patrick. On the last weekend in July this statue bore a sign with the schedule of masses to be celebrated atop the mountain all weekend. Some pilgrims recounted that, when they were children, their parents used to take them up the stairs as far as the statue and declare that they had, in fact, climbed the mountain. The statue more or less marks a boundary between civilization and the area that turns into more rugged mountain paths, and really stands as the beginning of the path. Along with the statue is a weathered sign that marks off the traditional stations. 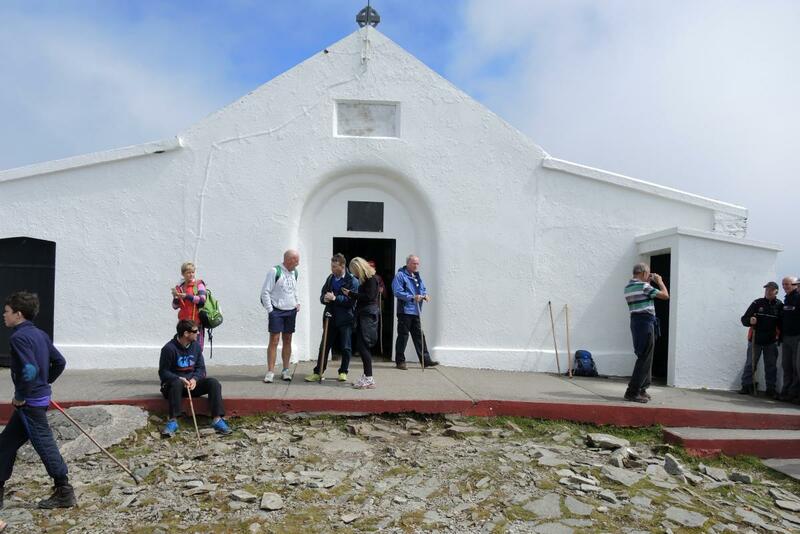 Much like the “stations” at Lough Derg, the stations at Croagh Patrick combine walking around different structures and reciting traditional prayers such as the Our Father and Hail Mary, a specific number of times. 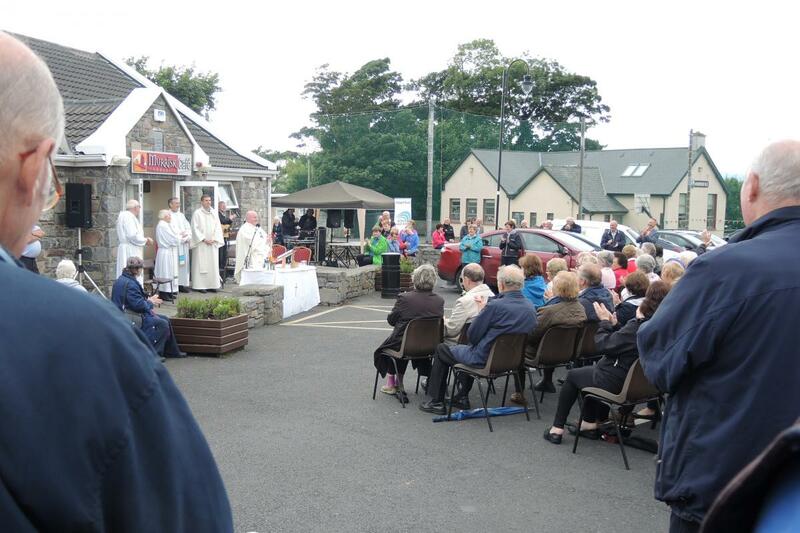 Unlike the prayers on Lough Derg, however, it seems that few contemporary pilgrims actually complete the stations as they are written. 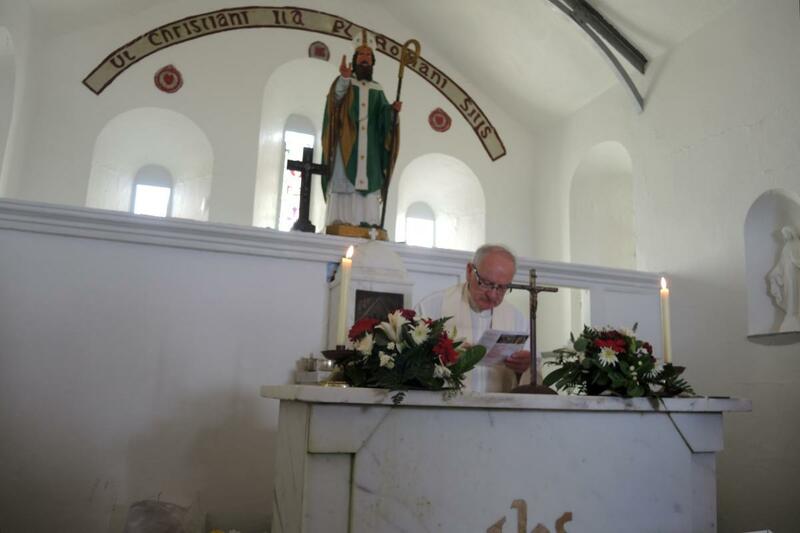 For the 2016 pilgrimage, the Archbishop of Tuam issued a prayer card with a new set of stations focused on the Year of Mercy declared by Pope Francis. 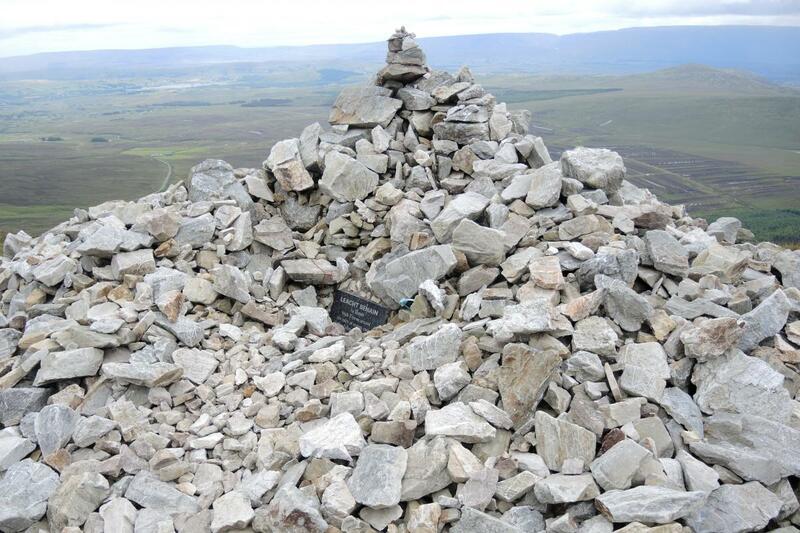 Rather than focusing on walking around different cairns of stones, or around the summit, the prayers encouraged pilgrims to stop for moments of recollection during the ascent and descent of the mountain. Most pilgrims, however, seem less concerned with the traditional canonical structures of the pilgrimage than with the actual ascent of the mountain itself. Just beyond the statue and the sign, one crosses through a gate in a fence meant to hem in the sheep that often roam the areas around the mountain. Past the gate one walks briefly through a small meadow before coming to a path that ascends the mountain alongside a stream whose source is in the mountain. Climbing alongside the stream, one notices that there is a fair degree of erosion along the trail, making it somewhat treacherous in places. 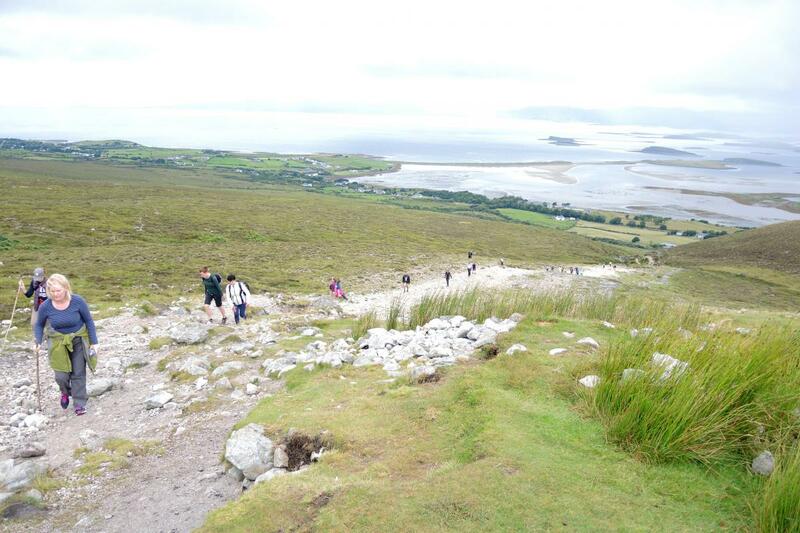 Some pilgrims still choose to follow the old tradition of climbing the mountain barefoot, and this practice is still fairly common among Ireland’s Travellers4, but the exposed stones and unsure footing in this area means that the majority of climbers wear at least sneakers, if not sturdy hiking boots, while climbing. The practice of climbing barefoot has been discouraged by local authorities in recent years. About halfway up the mountain pilgrims reach a level area known as “the ridge.” Atop the ridge pilgrims encounter stone cairns which constitute parts of the traditional stations. 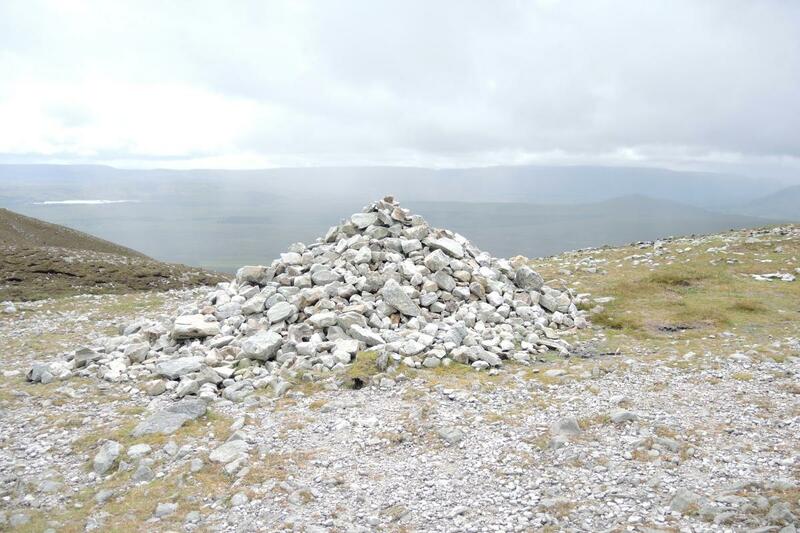 Archaeologists suggest that these cairns indicate that the mountain might have been a pagan burial place dating to the bronze age, subsequently Christianized to become “stations” of the pilgrimage.5 The practice of building cairns on sites such as Croagh Patrick during the bronze age seems consistent with the practice of building burial sites on top of hills. Near the cairns, pilgrims often arrange stones on the side of the mountain to spell out their own names, or the names of loved ones who they are remembering on their climb. 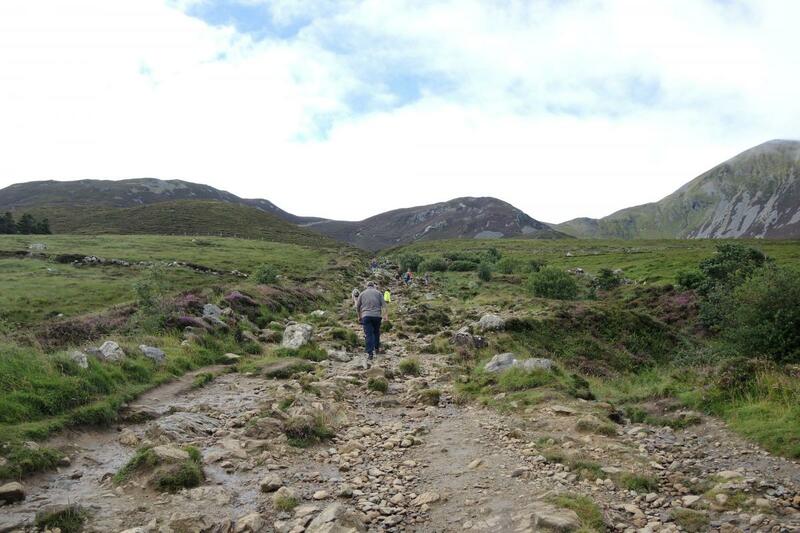 One family who was arranging stones in the name of their lost father noted that he climbed the mountain every year on Reek Sunday, and they were climbing in his memory. They left his name arranged in rather large stones on the side of the mountain in an area along with the other remembrances of lost family members, declarations of love, and the names of people who have simply climbed past that area before. During Reek weekend the ridge is also where the County Mayo mountain patrol sets up camp to help pilgrims injured or otherwise in trouble along the way. Nearby a local family has a small shed where they sell food and drinks to pilgrims as well, all of which are transported up on the back of an all terrain vehicle. 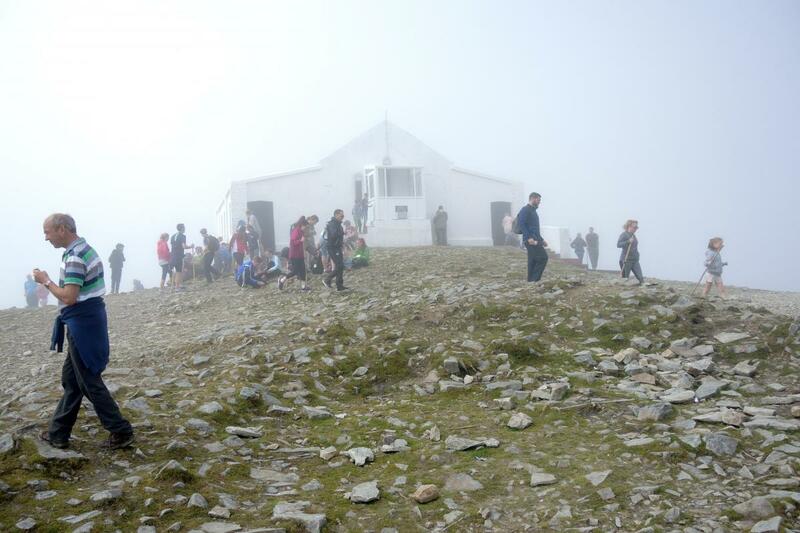 The presence of the mountain patrol speaks to the fact that this climb, while popular, can also be dangerous.6 The proximity of Croagh Patrick to the North Atlantic, along with the usual rainy Irish weather patterns, means that the weather conditions on the mountain change rapidly, and the often wet weather can leave the paths slick under pilgrims’ feet. 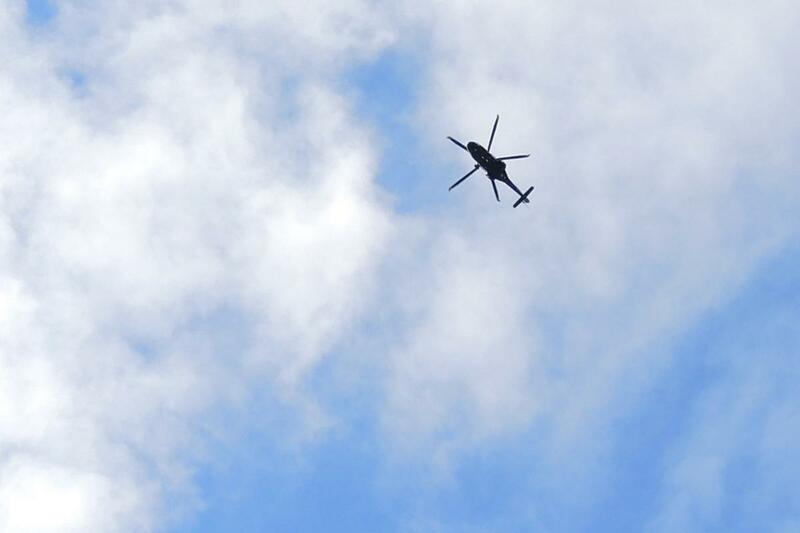 In 2015 the annual climb was canceled because of dangerous weather, and during Reek weekend 2016, a helicopter was used to ferry injured pilgrims off of the mountain with some frequency. The ridge is also the area where clouds will often settle on the mountain, obscuring both the view of the peak and the bay and plains below. 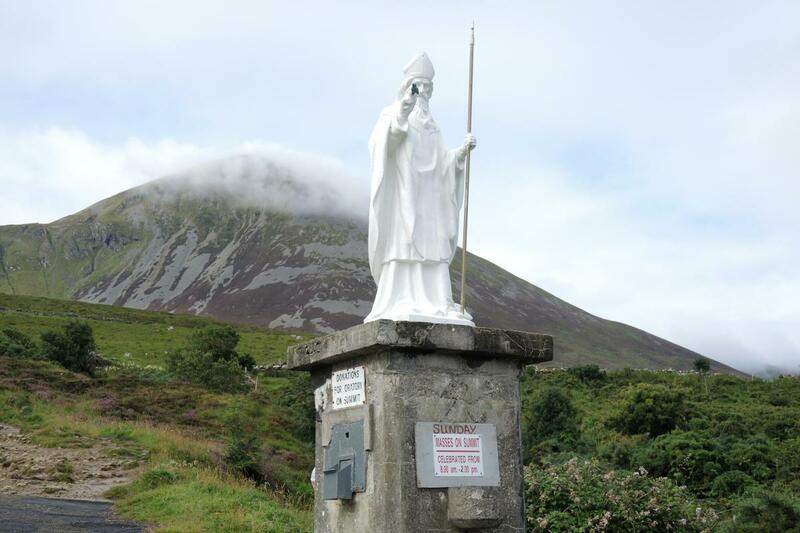 Upon finally reaching the summit, pilgrims encounter a sign which marks Croagh Patrick as “Ireland's Holy Mountain,” and an area of stones cordoned off, as many graves might be, with a small cross marked “St. Patrick’s bed.” Prayer cards, pictures of loved ones, and rosaries are sometimes left here. Beyond the sign and the bed, there is a small rectangular white chapel made of stone and stucco with Gothic pointed windows. The chapel was constructed in 1905 by people from the nearby village who carried all of the necessary materials for its construction up the mountain themselves. The front of the chapel looks west out over the bay and the ocean. While the space inside of the chapel itself is not very large, pilgrims pack themselves inside for Mass during Reek weekend. Priests from nearby are on hand for Mass and confessions at the top all weekend, and the local archbishop and the apostolic nuncio themselves also make the climb to the top on Sunday for Mass. 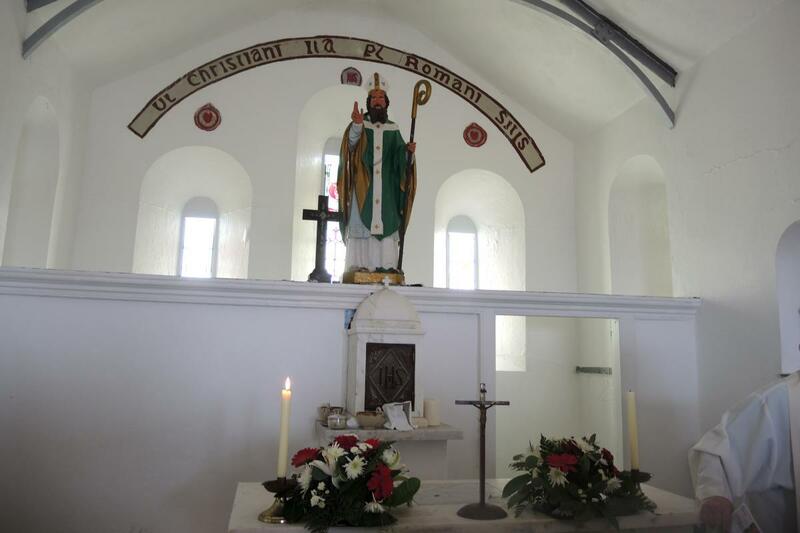 Given the traditional association of the site with Irish culture, it is intriguing to encounter Indian, Bangladeshi, and Pakistani immigrants, some of whom are not Catholic, among those praying and lighting candles in the chapel in front of images of Mary or the Sacred Heart or the large statue of St. Patrick. 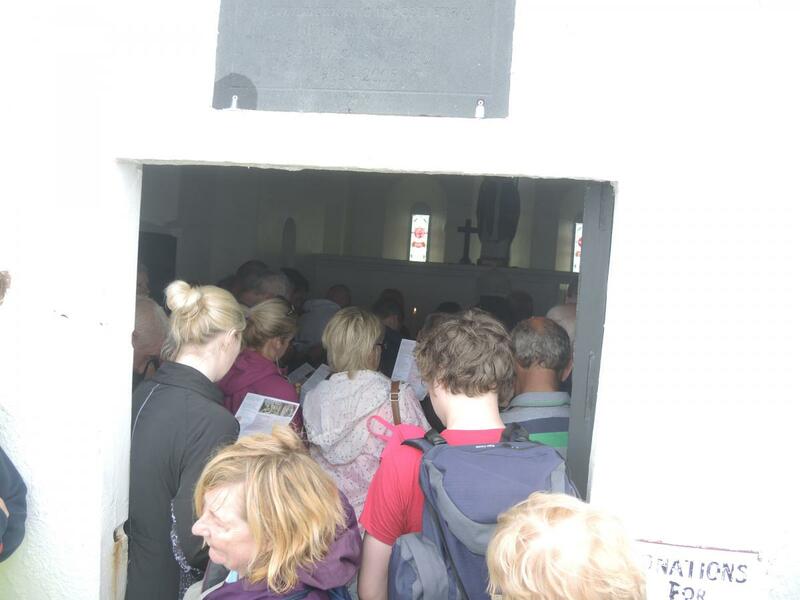 The congregations for Mass tend to overfill the chapel on Reek weekend, and when one enters in the chapel, out of the wind that buffets the summit, one is hit by the warmth of the candles and the warmth of the people gathered in the small space. The summit of the mountain is also a place of repose for many of the pilgrims. Many people take time to simply sit on the steps of the chapel and look out over the view and enjoy whatever food or drink they may have brought with them, while others take pictures of the surrounding view. Many people slip and fall, and the steepness of the mountain creates the illusion that, should one fall forward, it would be possible to fall off of the mountain altogether. At the same time, one feels a certain compulsion to console passersby who are still climbing to the top with the same words of encouragement that they are “almost there,” regardless of how much farther they may actually have to go. When asked if they had religious reasons for climbing the mountain, most pilgrims interviewed on Reek Sunday in 2016 seemed hesitant to say yes. It may be that like many places of pilgrimage, the why of it is hard to articulate, even where the practice suggests that something meaningful is still going on. For many the climb is a connection to the past, or, as in so many other contemporary pilgrimages, the ascent is itself a practice of spiritual seeking rather than of religious observance. 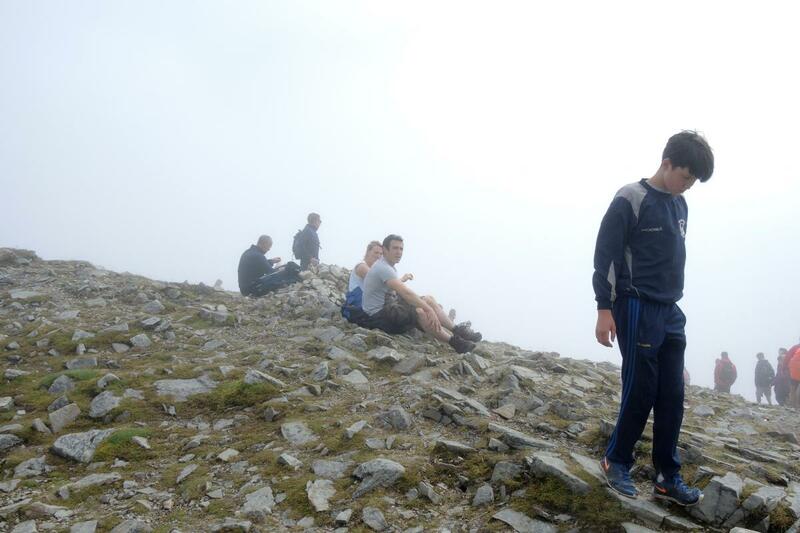 Other interviewees in their 20s and 30s linked it to their county Gaelic Athletic Association sports teams’ past practice of running up the mountain to train before the season.8 A man in his 20s from Galway, who was following the old penitential tradition of climbing the Reek barefoot, noted that his climb was about being closer to the earth. That, rather than penitential practice, was the reason for climbing barefoot. 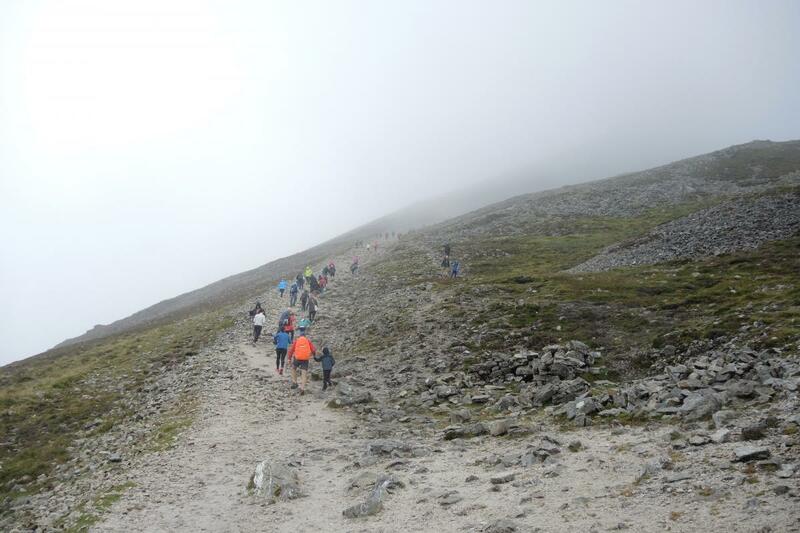 For many of the younger people interviewed it is clear that climbing Croagh Patrick was something uniquely tied to their culture, it was something that they did because they were Irish, and for many of them it seemed to require no further explanation. Still, for many people, climbing the mountain is an act of remembrance, both of individuals and of their own cultural identity. 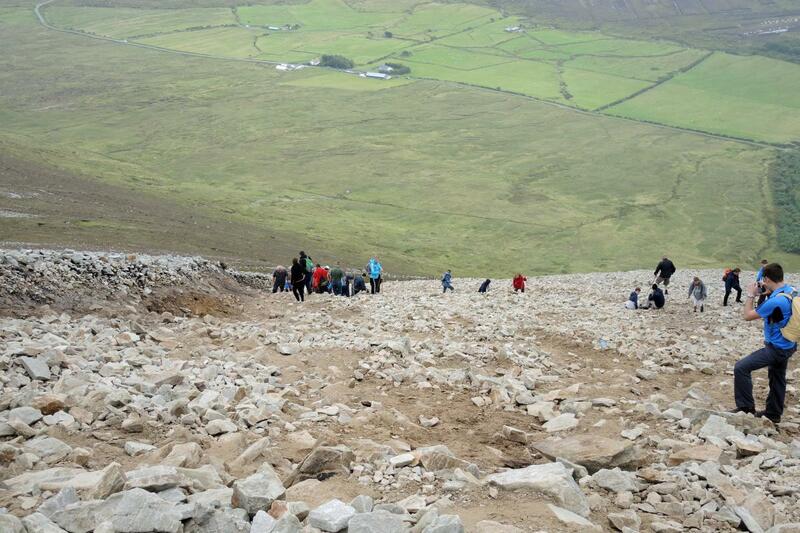 Many families climb the Reek as a group, and they very often bring children along with them for the long climb up. 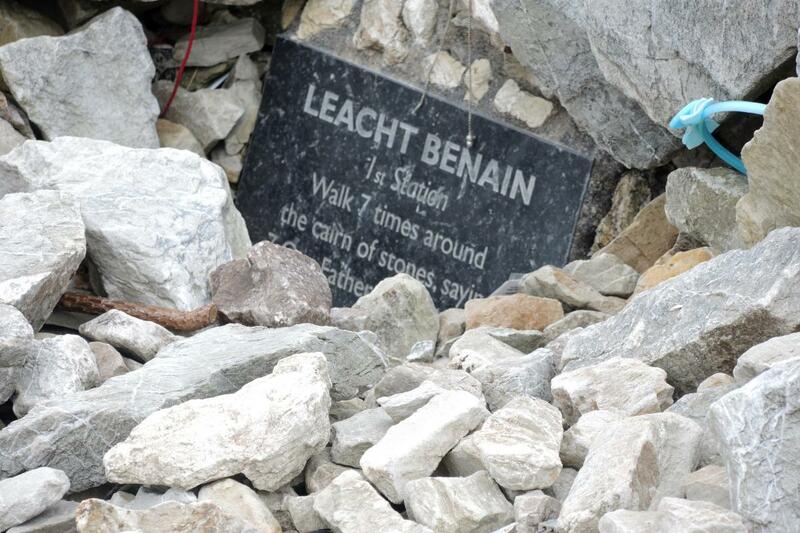 When pressed as to why they climb the Reek, several families indicated that they were doing it in remembrance of someone that they had loved who had died. It was often the case that the person being remembered by these families was someone who felt a particular connection to the practice of climbing the mountain, and that for them it was a religious practice. It is interesting to note that, while many people may not feel as much of a connection to the climb as a religious practice, many climbers still recognize the religious role that it played in previous generations, and seek to honor that practice. Conversations with families climbing the mountain also often yielded recollections of previous practices of climbing the mountain which have, for reasons of safety or preservation of the mountain itself, disappeared. Many people in this group remembered having climbed the mountain in the middle of the night in order to be at the summit for Mass at sunrise. This was often done in the dim light of candles and flashlights. One pilgrim recounted having heard the story of Patrick leading a community up the mountain in the middle of the night, only to have some of them killed at the top by lightning. 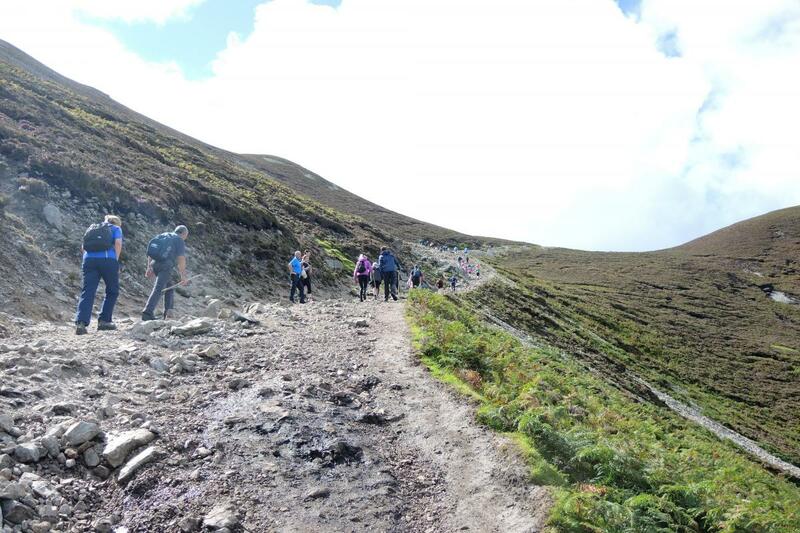 He quickly added: “Maybe the new rule is for the best.” Others remember when many, or even most people, climbed the mountain barefoot, a practice which is still maintained by Ireland’s Travellers community, but which has been largely abandoned by most pilgrims. In many of these conversations, there is wistfulness for the old ways, even if no one is intent on actually putting them into practice themselves. 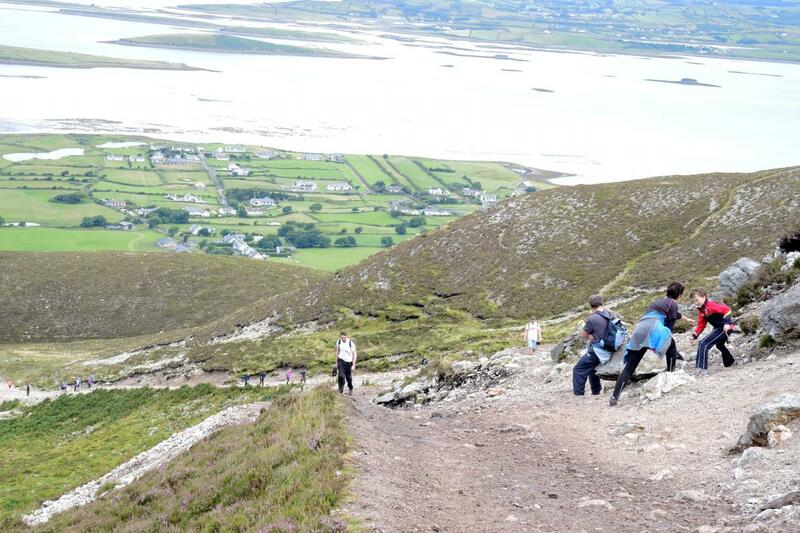 Despite the distance that many people climbing the Reek put between themselves and an explicitly religious rationale, there was still a sense among some pilgrims that the Reek is a place where one goes for religious reasons. One woman, originally from the United Kingdom but now living in the nearby town of Louisburgh, did not make an explicitly religious claim, but said, “That mountain is place where people go to ask questions and sort things out. It’s rare that one climbs without finding some answers.” For her there was a sense of the transcendent on the mountain, something that made the climb worthwhile in the very act of climbing itself. This is a sentiment echoed by many people who might describe themselves as spiritual but not religious or as seekers who ascend the Reek. For some interviewees in their 60s and 70s, the vein of pre-Christian religion, the link the site represents to ancient practice, was symbolically important. 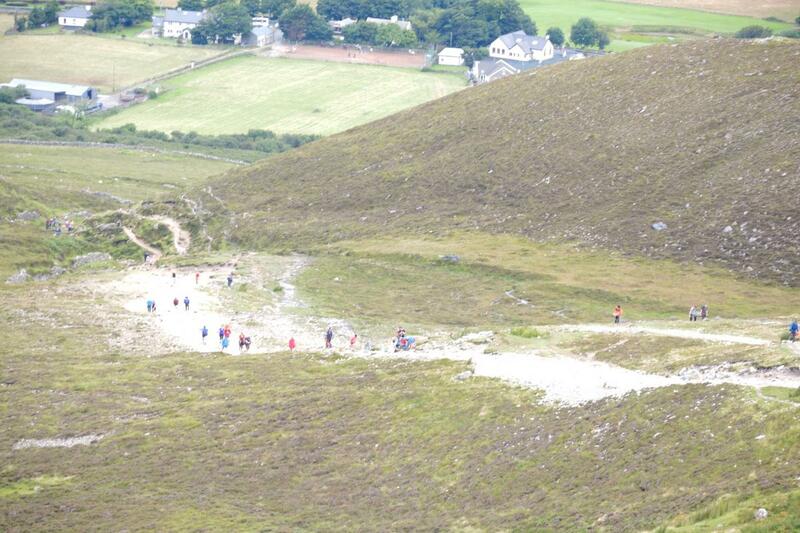 Groups of young people from nearby churches climb the Reek as an act of pilgrimage. 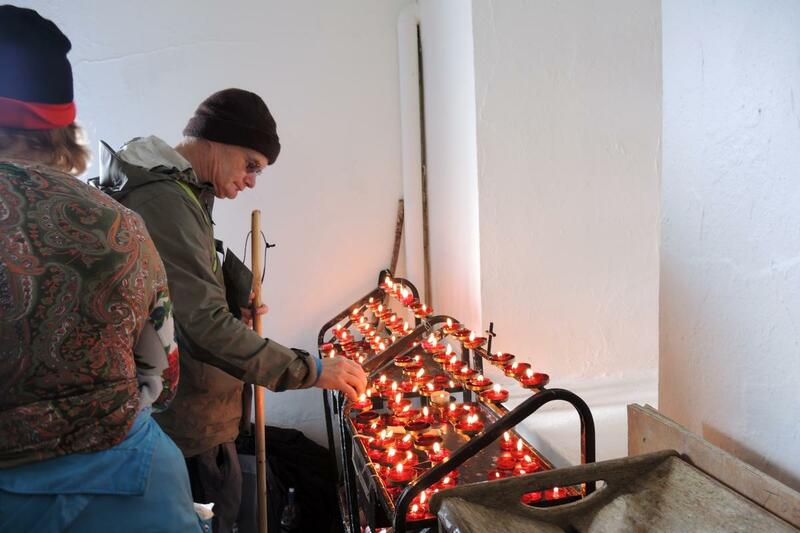 And despite the fact that many are hesitant to articulate explicitly religious reasons for their climb, the chapel atop the mountain is consistently overfilled during the annual weekend of pilgrimage. It may well be that while they were reticent to discuss it in the current post-scandal atmosphere of the Catholic Church in Ireland, there is a certain religiosity still inculcated in the practice of climbing the Reek, that it links them to something authentically Irish and spiritual. 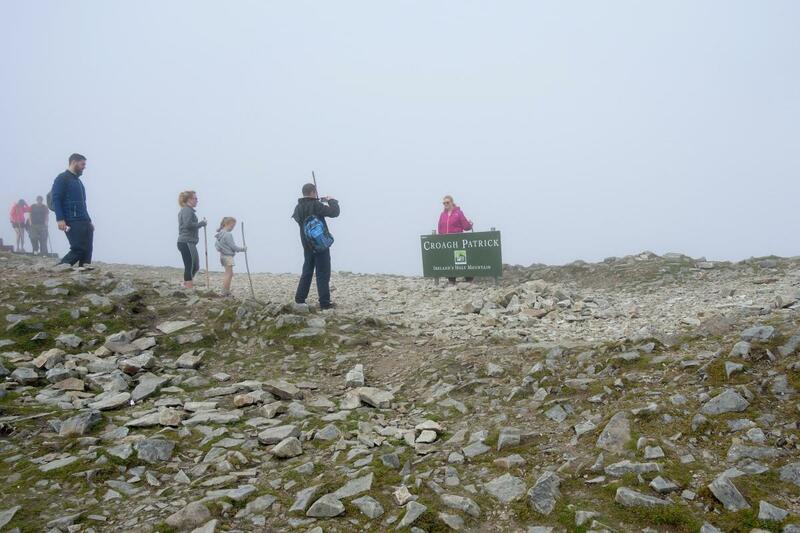 Whatever the reason, it is clear that climbing Croagh Patrick often touches the identity of those who climb. Whether linked to Irish history and culture, their family and lost loved ones, their religious faith — or layers of these in varying proportions — the pilgrimage to the top represents, for many, a reminder of who they are or where they came from. 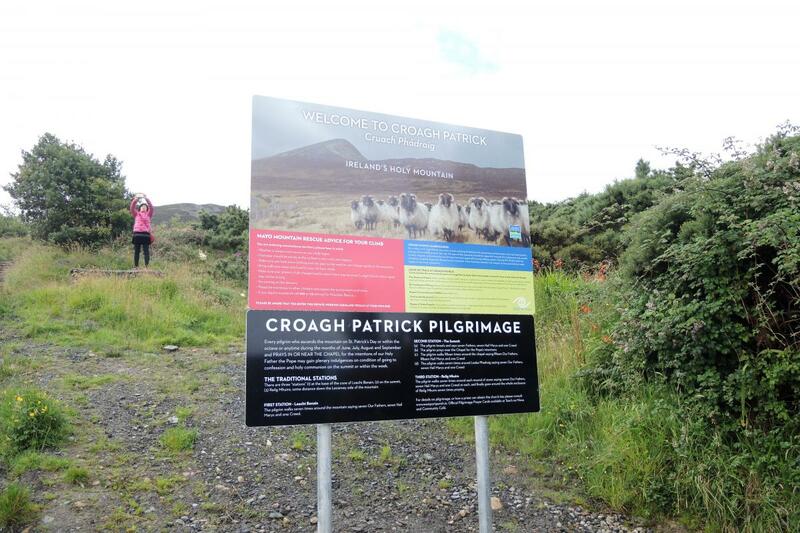 On an island where Catholic and national identity were once tightly interwoven but are now somewhat tattered after the scandal in the Catholic Church, Croagh Patrick still seems to serve as a place of remembrance, where each step climbing the mountain joins the millions of steps by those — perhaps even St. Patrick himself — who have gone before. 4. Travellers are an ancient population of itinerant people in Ireland. 5. 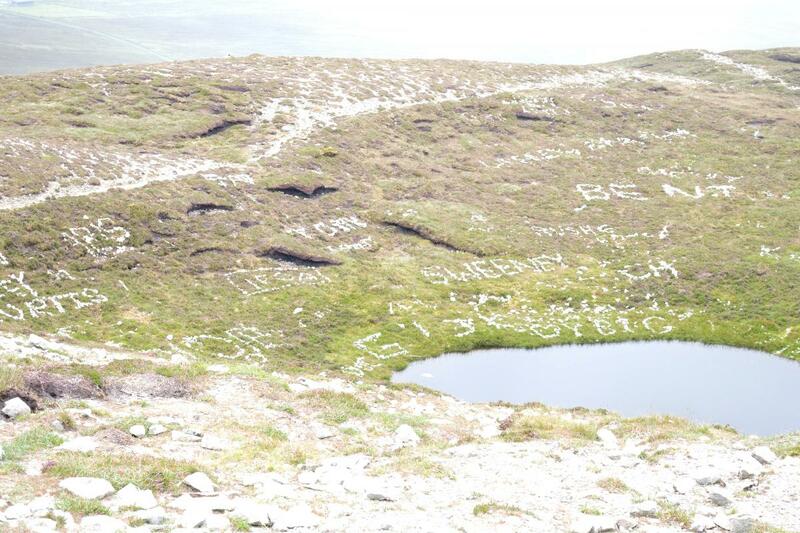 Corlett, "Prehistoric Ritual Landscape of Croagh Patrick, Co. Mayo," 11. 6. 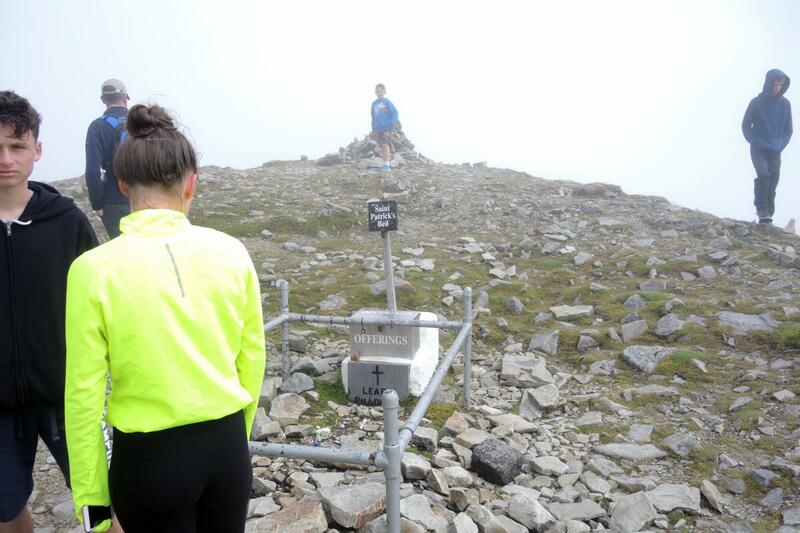 Bailie, "Take on Nature: Croagh Patrick, the most dangerous mountain in Ireland"
8. This practice has been discontinued because it was hastening erosion on the mountain.